It's always interesting to see how Walt Disney's animators handled the transition from storyboard to animation. The story sketch is supposed to inspire the animator to give life to a particular scene. I have seen story drawings that were very well worked out as far as staging, personality and the character being on model. In this case the animator has a relatively easy time to get started, because the material had already been given a lot of thought. Other times the story sketch is only a loose suggestion, and real brain work is required by the animator in order to plus the scene's situation. 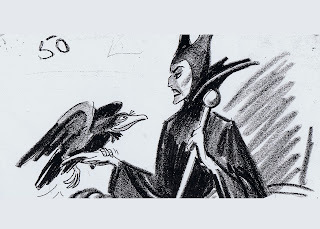 I am not sure who drew this story sketch, showing Maleficent just before she sends the raven off to find Aurora. It is a nice drawing, the two characters are facing each other in profile. 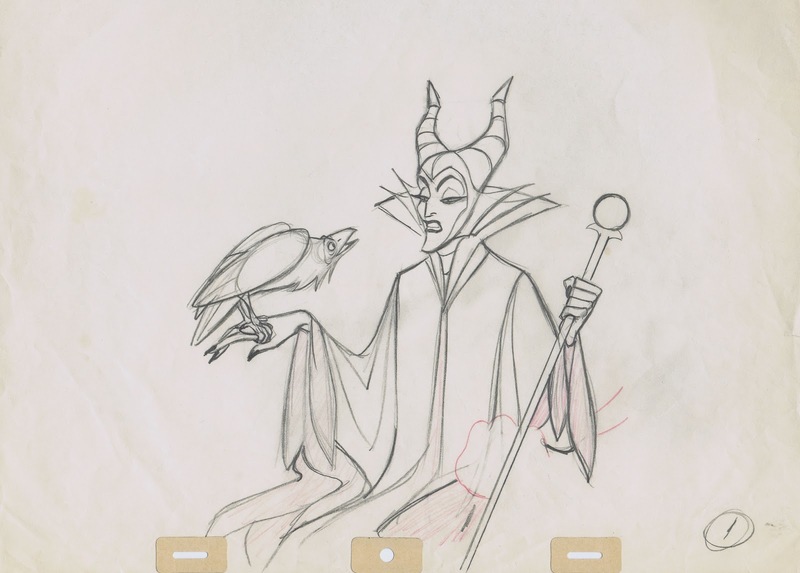 Marc Davis however improved the staging quite a bit by choosing a 3/4 camera angle. Now there is depth, and Maleficent and the bird seem to relate to each other within real space. Drawing wise this would be a challenge, because the film's character styling is very graphic and flat. Not too many animators could work with these shapes and move their characters in three dimensions. As you can see Marc was an expert at this.